This is a recipe from our recipe book: Wedding week at The Lark Inn. For those of you not familiar with this recipe book, it is something we put together after our daughter’s wedding. The wedding was a destination event so, as all the guests arrived during the week prior to the wedding, we were cooking for an increasing number of guests. We reached the peak at the Dinner the night before the wedding and the brunch the morning of . . . about 100 guests. This recipe is for apple smoked pork chops my husband Pat made for our Monday night group of about 15 friends and relatives. In the next few days, I will be sharing more recipes from that day. Save them and put them together for an outstanding dinner party! 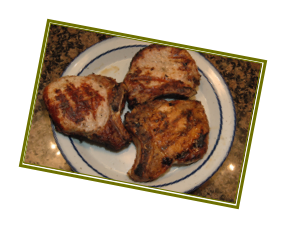 2 Packages of 10 Center Cut Pork Chops (make sure they are about 1/2″ thick. Start smoker with apple wood in the smoke chamber and crank the heat up to high. On our Treagor electric smoker, that is about 425 to 450°. Tip: You might want to use a tray to put one of the groups of chops on to make room for the other set of chops . . . otherwise you could become trapped in a terminal do-loop of making room on the grill for the smoked chops . . . but there isn’t room . . . I better move them . . . but there isn’t room . . . so I better move them . . . we don’t want to have to send someone over to rescue you. If you think this may be a problem . . . you should probably not cook pork chops alone! This could be especially dangerous if alcohol is involved. I hope you enjoyed this recipe. As I said before, save these “Wedding at The Lark Inn” recipes and put them together for a great meal for whatever occasion. Visit my web site for videos, menus and a schedule for upcoming cooking classes at The Lark Inn. This entry was posted on February 20, 2012, 9:32 am and is filed under Cooking and Baking. You can follow any responses to this entry through RSS 2.0. You can leave a response, or trackback from your own site.